“Where’s the beef”? In its rightful place; wedged inside two slices of our Organic Multigrain Bread with Quinoa. There’s a secret to an ideal roast beef sandwich. Using beef is part of it, but lodging it snuggly & deliciously between two slices of our bread is the key. Undoubtedly you’ve eaten “roast beef” sandwiches that tasted as if they had neither. Well, that ends here & now. Thank the herbed goat cheese and arugula for extra zing, but thank us for the recipe. Spread Goat cheese on 1 side of each slice of bread. 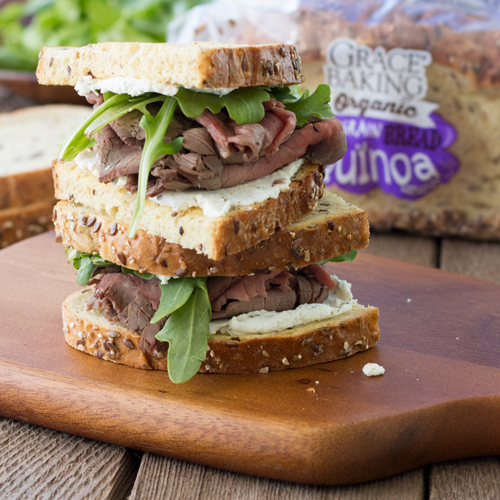 Layer roast beef and arugula on 1 slice, and top with remaining bread slice.